I've reviewed a lot of chai products these past few years. Chai here, chai there, chai, chai everywhere. Before her untimely departure from this earth last year, my mother even jumped on board the chai bandwagon. Like a good Oprah-ite, she dutifully sought out Ms. Winfrey's offering at the local Starbucks and proudly declared herself a fan of chai tea and chai lattes. My wife claims the Oprah Chai isn't even that good. I'll take her word for it. Of all the chai selections I've tried, only one has ever fallen drastically short of my expectations. 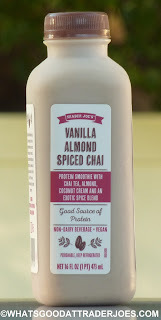 As far as I can tell, it's pretty hard to screw up chai. Although...um...one good way to do that might be to try to turn it into a protein shake. Granted, I don't really drink protein beverages, so I'm not sure if they all tend to have that nasty, powdery, chalky essence about them. 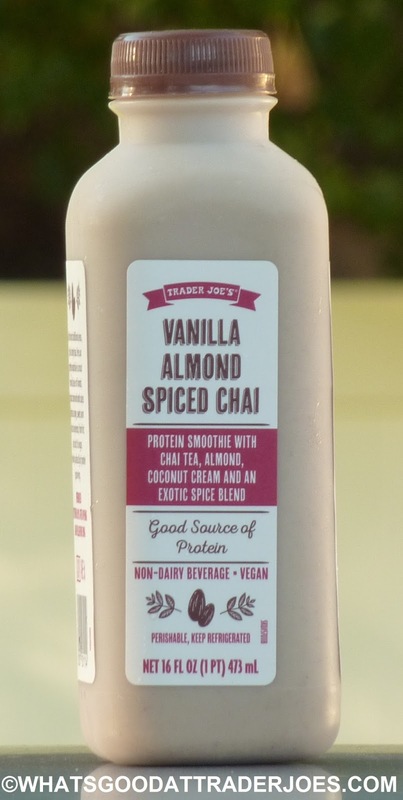 But for me, having that bizarre taste and thick texture present in what I was hoping would be a smooth, sweet, spicy chai beverage was quite an unpleasant surprise. Sonia, who's far more of a chai aficionado than I am, genuinely liked this drink. She liked that it "wasn't too sweet" and really enjoyed the flavor, although her one complaint would be that it "lacked a bit of kick" in the spice department. I know black tea in general has a decent amount of caffeine, so this beverage packs a significant punch in that way. I had already had my daily dose of caffeine when I tried this, so it made me a tad jittery. I think the label-putter-onner guy was drinking some too, because as you can see in the pic, the sticker on the bottle is slightly crooked. This is one Sonia and I will agree to disagree on. I found it mostly unpleasant and would file this under "not so great." Sonia would lean more toward "really darn good." So we'll meet somewhere in the middle and say it's "not bad." The Oprah Chia is so good. I love clove everything (except cigarettes) and it's the cloviest. I agree with you about vanilla almond spiced Chia. It's flavor was ok (though not enough cloves) but the texture was unpleasant. Lotsa sugar in there - I'll pass this time. Thanks for the review! If one isn't oppose to dairy, a Chai latte with milk will give you at least 8g protein. I too enjoy a very spicy chai - my favorites are the ones that lightly burn in your throat. Usually a high amount of ginger will accomplish this.I love Blue Lotus chai. Blechhh. Had high hopes for this. Like all the ingredients. Almond paste? Coconut Cream? Cardamom? Mmmm! Not so much. Smells like Christmas and tastes like a candle. May try to thin it out with milk or blend with bananas. But could just end up with a larger quantity of a yucky thing.